Customer service at companies like AT&T, Comcast, Bank of America and others can be an incredibly frustrating experience. And I’m willing to guess that most of you have had a poor experience with a customer service agent at a cellphone carrier, bank, or cable company. Today, Insidr, an independent customer service marketplace that connects you to people and customer service agents who have worked in big companies, is launching to help consumers handle these situations. 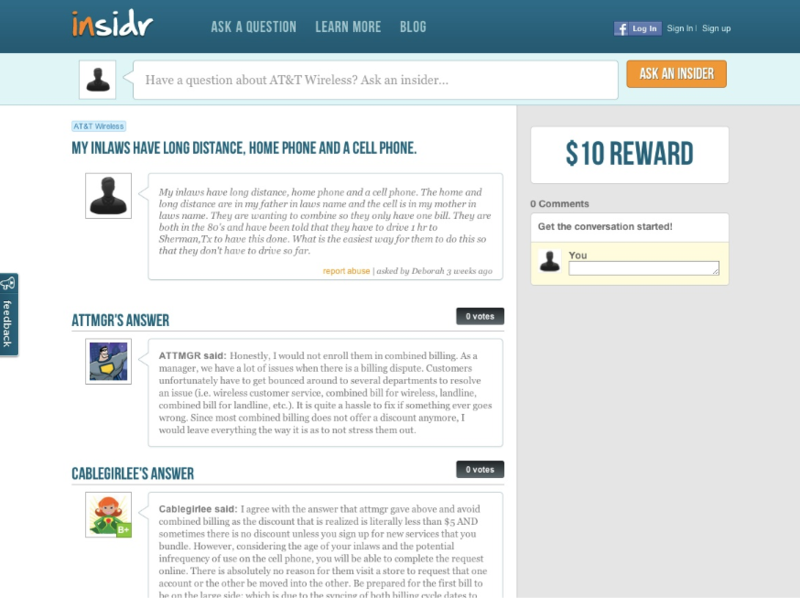 Insidr lets you post an online question and, optionally, offer a reward for insider information from a big company. Insidr has a group of insiders, who are former or current customer service agents, engineers, and other employees from AT&T, DirectTV, Verizon, Bank of America, that can help answer your question. Clearly these insiders are better at cutting through red tape and getting answers. The startup says that because insiders are working independently to earn your reward, you can reach people you wouldn’t normally get on the phone, the insiders can be candid and they’re motivated to help you (with the possibility of the reward). The “insiders” offer help, and you release the reward to the insiders only if satisfied. Insidr has been in private testing mode for 10 months. At public beta launch, 1,280 insiders offer support for nine companies: AT&T Wireless, Bank of America, Comcast, DirecTV, Dish Network, Sprint Network, Sprint Nextel, T-Mobile, United Airlines and Verizon. During private beta period, roughly 4,810 people asked 1,280 insiders for help. Today, 100% of questions get answered in an average of 30 minutes. The average reward is $8.00 and 85% of people who offer rewards release them to insiders. Insidr splits rewards fifty-fifty with insiders. For example, a T-Mobile insider helped a customer get a full refund instead of an account credit. A Dish Network insider helped a customer avoid early termination fee. “We started Insidr because we felt frustrated and helpless when we had to call customer support. We decided to find a better way,” said Antony Brydon, CEO and co-founder of Insidr. Brydon, and co-founders Jeff Patterson and Jean Tessier formerly launched ShopWell out of IDEO in 2010. Insidr is backed by $500,000 in seed funding from True Ventures, Gil Penchina, Karl Jacob, Brian Witlin and Samer Hamadeh. Do you have a customer service question for a company that currently doesn’t have an ‘insider’ on Insidr. TechCrunch readers can request coverage for a new company here, and Insidr will add the company that readers request the most in the next week. If Insidr can scale to include insiders at a variety of companies, the startup could build a really useful business to consumers. Inside information to navigating some of the more complex customer service situations, such as billing issues, is worth a premium considering how frustrating it can be to go directly to the companies, themselves.